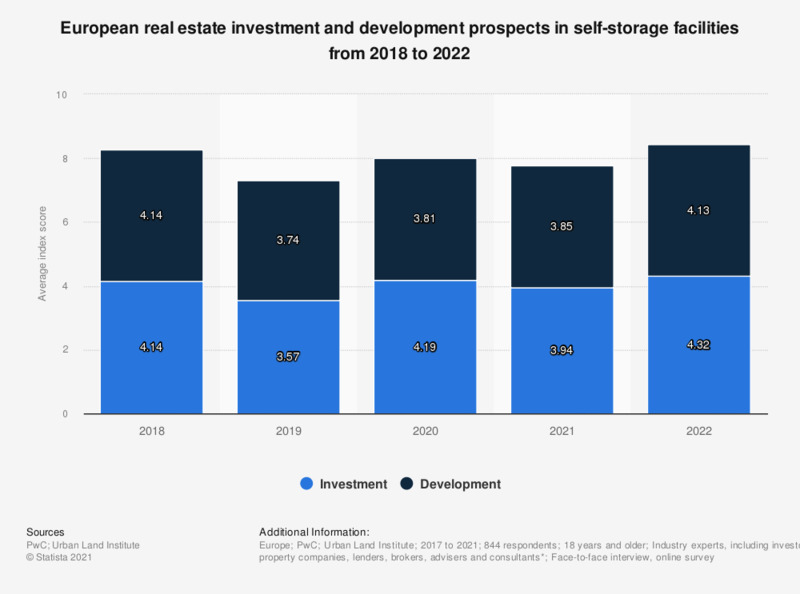 This statistic shows the prospects of investment and development in the self-storage facility infrastructure on the real estate market in Europe in 2018 and 2019. For both investment (3.57) and development (3.74) of self-storage facilities in Europe in 2019, the outlook according to industry experts look good, although not as favorable as 2018's outlook. * The survey was made up of respondents from twenty two European countries and made up from the following professional industries. The source adds that respondents could choose more than one category, so percentages do not add up to 100. Real estate service firms (30 percent), Fund/investment managers (24 percent), Private property company or developers (23 percent), Institutional/equity investor (15 percent), Bank, lender or securitized lender (7 percent), publicly-listed property company or REIT (11 percent), homebuilder or residential developer (6 percent) or other (4 percent). ** Respondents scored sectors' prospects on a scale of 1=very poor to 5=excellent, and the scores for each sector are averages; the overall rank is based on the average of the sector's investment and development score. *** A significantly lower number of respondents scored this sector.